Plants greenish to grayish, 2-15(-25) cm, ± lanuginose. 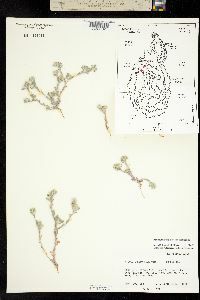 Stems mostly 2-10; branches proximal and distal (distal subopposite), rarely none. Leaves: largest 7-13 × 2-4 mm; capitular leaves subtending glomerules, also ± hidden between and surpassed by heads. Heads mostly distal, in subdichasiform arrays, campanulate to ± spheric, 2-3.3 mm, heights ± equal to diams. Receptacles pulvinate, 0.3-0.6 mm, heights ± 0.2-0.5 times diams. Pistillate paleae scarcely imbricate, longest 1.9-2.7 mm. Staminate paleae mostly 3-5, apices somewhat spreading, ± plane. 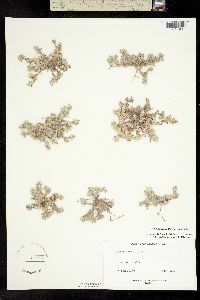 Functionally staminate florets 3-5; ovaries vestigial, 0-0.1 mm; corollas hidden in heads, actinomorphic, 1.8-2.5 mm, often ± spreading-arachnoid, lobes equal. Bisexual florets 0. Cypselae rounded, ± terete, mostly 0.7-0.9 mm. 2n = 26. The two varieties of Diaperia verna intergrade within a broad band inland from the Gulf of Mexico in southeastern Texas. 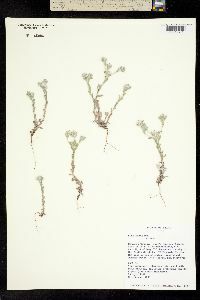 Though some specimens are difficult to assign with confidence, the varieties show enough correlated geographic and ecologic segregation to warrant taxonomic recognition. 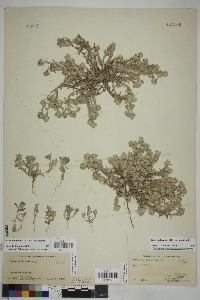 As neotypified by J. D. Morefield (2004), the name Evax verna now applies to the taxon that de Candolle named E. multicaulis.